Greta Horner holds a photo of her and her husband Ed taken a few months before he died. 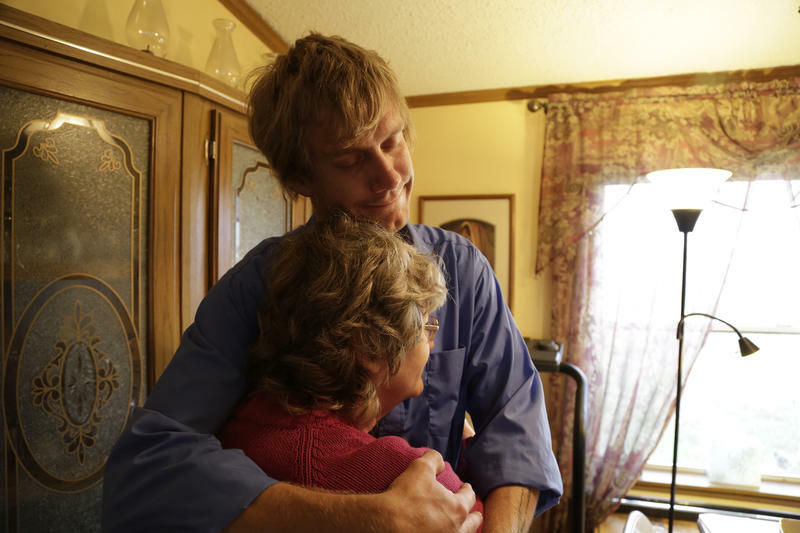 Tyson Horner hugs his mother Greta in their rural Larimer County, Colorado home. 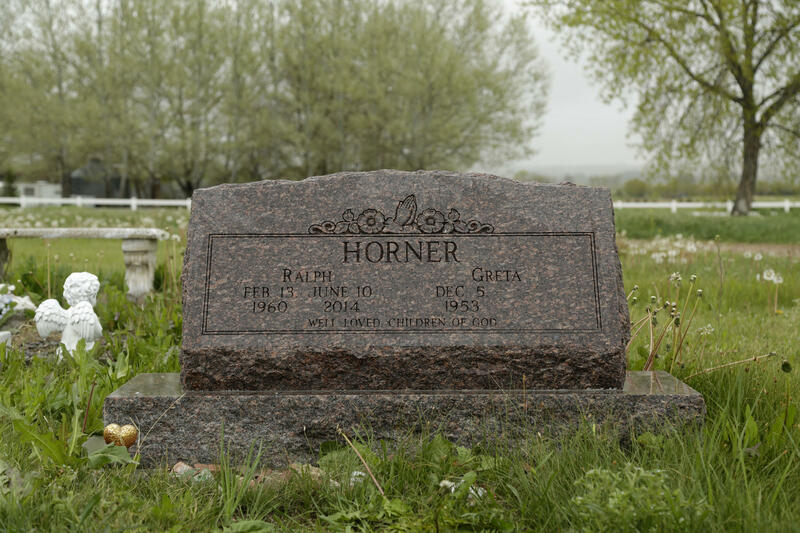 Ralph "Ed" Horner is buried a short drive from his rural Larimer County home. An OSHA photograph shows changes made to the conveyor belt at the JBS beef processing plant in Greeley, Colorado, that killed Ed Horner. It's now covered in a metal mesh. This is the first in a three-part series from Harvest Public Media, "Dangerous Jobs, Cheap Meat." 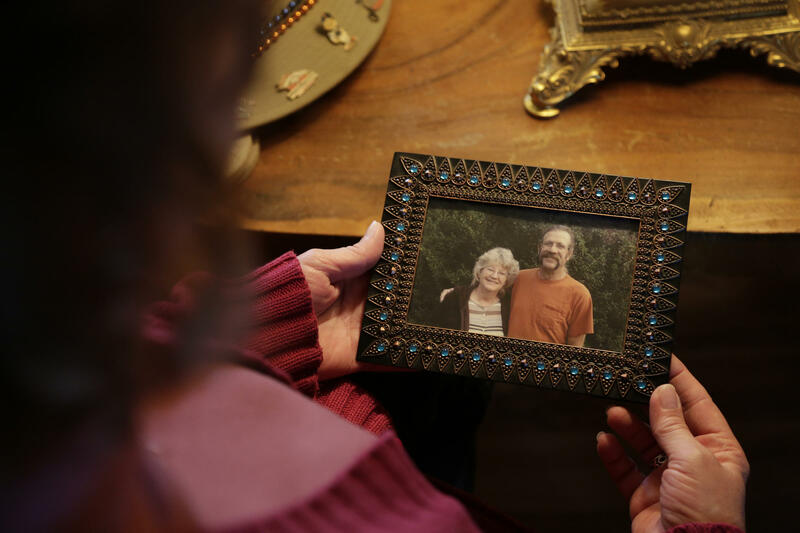 Ralph Horner, or Ed as his family calls him, should've been pulling in the driveway any minute that morning in June 2014, home from his overnight shift as a maintenance employee at the beef plant in Greeley, Colorado. It's owned by JBS, the world's largest meatpacker, with its North American headquarters a short drive from the Horners' rural Larimer County home. Instead, three cars – one from the coroner's office, one from the sheriff's office, one from JBS – turned down the long, dirt driveway. 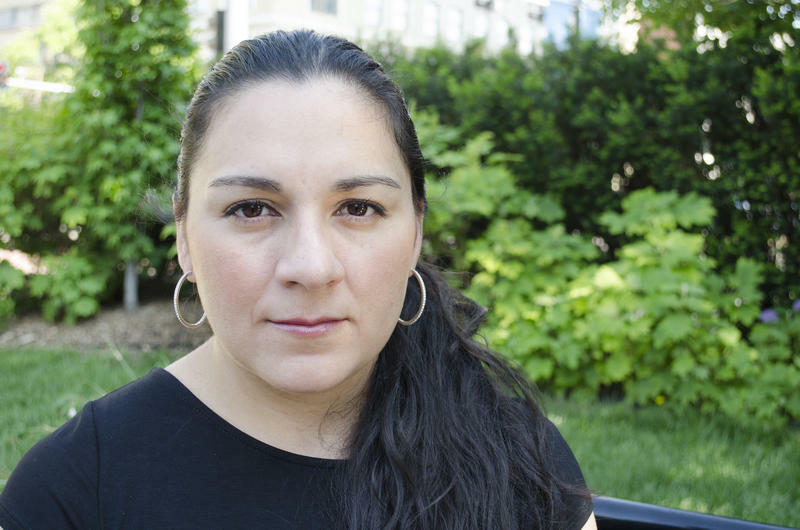 "They seemed to be going so slowly, and I thought this isn't good," she says. She met the cars at the gate, still dressed in her costume, already filled with dread. "They introduced themselves and I just said, 'Don't tell me. I don't even want to know. Don't tell me. Don't tell me.' Because I just knew." Ed died a few hours earlier. He was working alone deep in the bowels of the plant on a piece of equipment. It caught his hair and the sleeve of his shirt and pulled him in. His clothing bunched up around his neck and mouth. And there, trapped under a conveyor belt, he suffocated. He was 54, and left behind his wife, three sons and a grandchild. The workplace for the hundreds of thousands of people who prepare beef, pork and poultry in this country is a hazardous place. 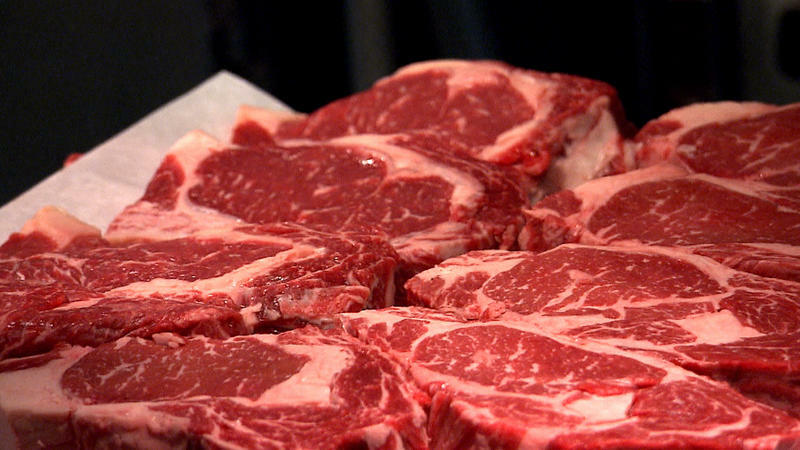 Meat and poultry processing plants are safer than they were a decade ago, government statistics show. But the reality is, in today's slaughterhouses, some workers pay a steep price to produce our meat, sometimes with their lives. "I don't know what Ed could've done to be any more safe," Greta says. Today's beef, pork, and poultry plants function though a sort of organized chaos. Workers use a mix of hydraulic saws, industrial blenders, marinade pumps, steel hooks, metal chains, and conveyor belts to disassemble cattle, chickens and hogs, turning whole animals into cuts of meat. Line employees don smocks and chainmail to keep from cutting themselves or their coworkers nearby. Mats line the floors to avoid slips on blood or water. The Greeley facility, which JBS took over in 2007 with its purchase of Swift Foods, is a behemoth in the beef processing industry. Originally built in 1958, the facility's employees are able to slaughter and process upwards of 5,600 head of cattle each day. It takes more 3,000 people to keep it up and running. Daytime and evening shifts work the lines, slaughtering, slicing, bagging and boxing, while overnight maintenance and sanitation crews clean and prep the plant for the next day. "You're trying to manage a small city," says Doug Schult, a JBS USA human resources executive. "When you take machinery and all those people, and those knives, you've got an environment that is risky. So you've got to accept that the risk is there. You don't have to accept that people get hurt along with it, though." The industry has changed drastically since the 1906 publication of "The Jungle," Upton Sinclair's muckraking novel that revealed poor food safety and workplace conditions in the Chicago stockyards. But people still get hurt or get killed. 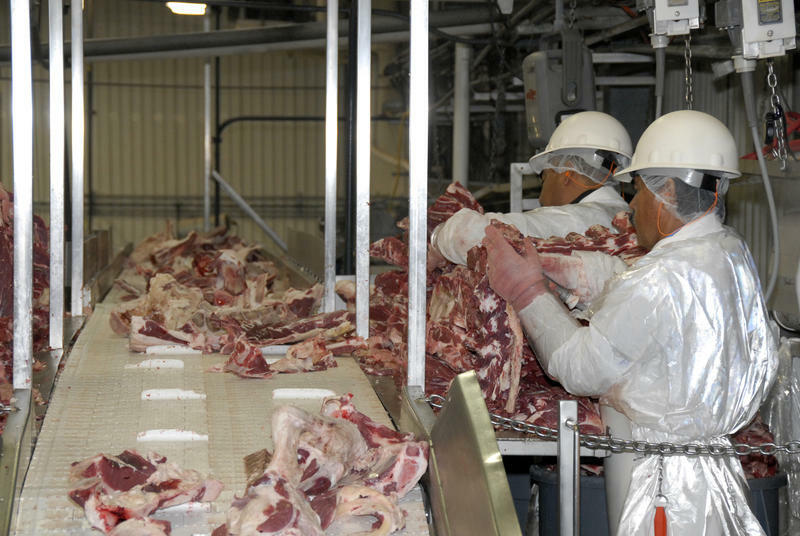 Some 151 meat and poultry workers suffered fatal injuries from 2004 to 2013, according to a recent Government Accountability Office report, which also focused on the underreporting of injuries in this industry. That compares to the 3,737 manufacturing facility workers [pdf] who died on the job during that same period, according to the U.S. Bureau of Labor Statistics. Meat and poultry plants consistently report higher injury rates than the manufacturing industry overall, with beef and pork workers sustaining a higher rate of injuries and illnesses than poultry workers, according to U.S. Department of Labor data. Government safety regulators recognize the risk inherent in meatpacking. The Greeley plant is under the jurisdiction of the Occupational Safety and Health Administration's Denver office, and a subject for the team of inspectors there who check workplaces for violations of federal safety standards. Ed Horner's death triggered a flurry of activity for those government regulators. The law required the conveyor belt he was working on to be covered with a guard, meant to keep workers from suffering amputations or being pinched and pulled. If OSHA catches it on an inspection, an absent guard brings a fine. A missing machine guard remains a highly cited violation from OSHA, especially in industries where heavy equipment is used, like manufacturing, construction, and meatpacking. Both OSHA officials and industry representatives agree, they're easy to miss. In Horner's case, OSHA scolded JBS in a press release after the incident, saying the company should've known better. If JBS had followed well-known safety practices, his death could've been prevented, the release said. Even with the strong language, the final fine for the violations that led to Ed Horner's death totaled $38,500. "Yes, it's embarrassingly low," says Debbie Berkowitz, a fellow with the National Employment Law Project, and a former senior OSHA official. "And because of that it's unclear what kind of deterrent effect it really has." OSHA fines are set to increase in August 2016, for the first time in 25 years. In 1990 other federal agencies were given permission to raise penalty amounts tied to the rate of inflation. OSHA wasn't given that permission, and Berkowitz says that's left the agency unable to financially punish bad actors. Any increase to OSHA penalties must go through Congress. The fines associated with Ed Horner's death were lowered from an initial $45,500, after one violation was dropped during an OSHA settlement process. Lowering initial fines is a standard practice by OSHA across all industries. An investigation by Harvest Public Media found OSHA's initial fines for safety violations in meat and poultry plants are, on average, just under $20,000 per case. But companies end up paying even less, negotiating down to about $11,000. The Greeley plant had a history of missing or lacking machine guards. During an inspection in 2008, the facility racked up serious violations for lacking machine guards, among other citations. Fines for violations found during that inspection totaled $22,000, settled down from an original fine of $32,100. 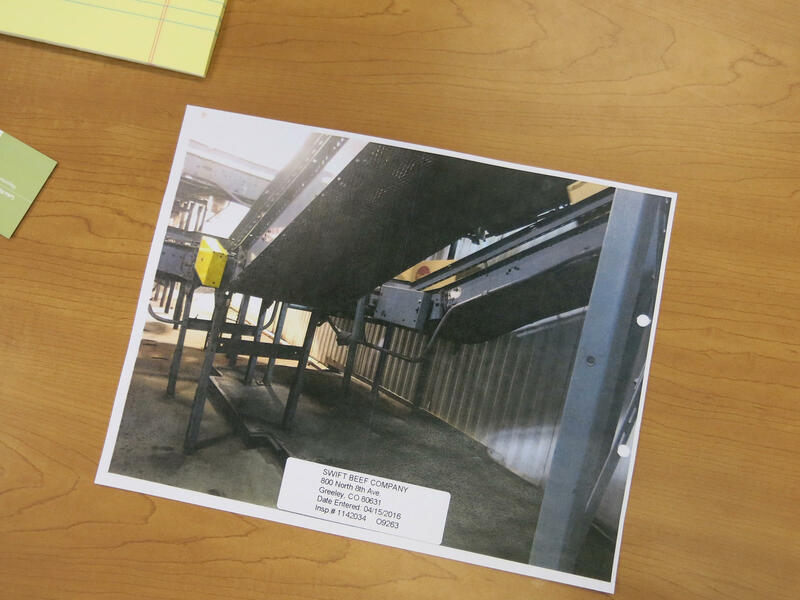 Inspectors recorded machine guarding violations in 2012 as well, during an inspection program designed to target high hazard workplaces, earning the company $83,414 in penalties. After contesting the violations, JBS ended up paying $64,668. In 2014, JBS S.A., the Brazilian parent company for its North American arm, reported about $38 billion in net revenue, and earned about $650 million in profit. OSHA decided to make the company's problems with machine guarding even more public in 2016. As a part of the settlement related to Ed Horner's death, OSHA placed the company on a publicly-available list of companies that have "demonstrated indifference" to federal safety standards, called the Severe Violator Enforcement Program. JBS will remain on it for three years and be subject to more inspections and more OSHA oversight. The $38,500 fine JBS paid for the violations that led to Ed Horner's death was higher than most, says Herb Gibson, OSHA area director for its Denver office. The agency assesses fines based on violations to the Occupational Safety and Health Act of 1970, not based on injuries or fatalities those violations actually cause, Gibson says. A worker death, and possibly a serious worker injury, will spur OSHA into action to conduct an inspection, but a worker death doesn’t necessarily influence the final fine the company pays, even if one of the violations plays a role. "In my personal opinion, the fines could be modified for fatal cases but that's not what the law -- it doesn't have a separate penalty for a fatality," Gibson says. "And that would require legislation to change that particular provision." As for acting as a watchdog to the country's hundreds of meat and poultry plants, large and small, OSHA officials, current and past, say they're limited by the agency's tight resources. About 2,000 inspectors are tasked with keeping the country's millions of workplaces safe and illness-free. "Unfortunately, it would take OSHA a hundred years to get to every workplace, just once to inspect," Debbie Berkowitz says. "So really a lot is up to the company." Early in 2014, JBS executives in Greeley were looking over their injury rates and feeling optimistic. Over the last several years they'd been able to limit certain problems, measured using a rate that tells the company's leaders how many serious injuries workers sustained and caused them to miss work. Since JBS took over the Greeley plant in 2007, that rate had been declining. It was good news. Confident enough that existing safety programs were working, they began focusing on a second-tier, more tailored to help employees with ergonomic support to prevent repetitive injuries, another nagging problem for the industry. Then came the summer of 2014, when JBS and its affiliated companies in North America had four worker deaths in a five-month span, stretching from the summer into early fall. "The summer of 2014 told us that while the figures said one thing, something more systemic, more foundational broke," says Chris Gaddis, a JBS human resources executive. Two months after Ed Horner's death in Colorado, tragedy struck again at the Pilgrim's Pride poultry plant in Nacogdoches, Texas, when employee Bobby Beall was electrocuted. JBS USA owns a controlling interest in the poultry processor with plants scattered across the southern U.S. Beall's obituary notes he enjoyed hunting and fishing, and was known around the poultry facility for sharing candy with his co-workers. One month later in September, a JBS employee in Alberta, Canada, Christopher Harper, succumbed to severe burns he sustained from a burst steam pipe while working at the company's beef plant in the small town of Brooks. Being a devout hockey fan, Harper's obituary requests donations in his memory be sent to the local junior league, the Brooks Bandits. In October, Pablo Lopez Romero of Mount Pleasant, Texas died while working at the Pilgrim's Pride plant there. A large piece of ice fell on Romero's neck and chest, killing him. Lopez Romero's obituary says he left behind a wife of 35 years and two grandchildren. It was a string of tragic events, each one exposing hazards and safety lapses at the plants involved, and a problem that would take much longer to address than simply adding new guards to machinery or rolling out a new training regimen. JBS had a cultural problem, and executives agreed it would take more than additional OSHA visits to fix it. "No fine could've created as much change and momentum towards improvement as losing a team member," Gaddis says. "We don't need OSHA to come in and find this stuff, we need to find it ourselves," Schult adds. The section of the plant where Ed Horner died was a secluded maintenance room, tucked away in a portion of the plant few employees move through. He had climbed underneath a moving conveyor belt. JBS executives say they simply hadn't identified it as a hazard. "It involved guarding of a piece of equipment that we had not, frankly, focused on in the past," Schult says. Not only was JBS losing workers in that five month span in 2014, but safety blind spots were staying hidden until tragedy struck. Realizing that a certain amount of complacency and comfort in their own safety protocols may have led to a situation that put a worker at risk, Gaddis says the company reacted, calling in a third-party risk assessment team to find additional hazards, and looked at changing internal policies to encourage reporting safety problems, rather than stifle them. For years JBS had functioned under a "cardinal rule" policy, where a list of rules guided employees on what to do to stay safe on the job. Break a rule, and you're fired. Zero tolerance. But it wasn't working, Gaddis says. Instead it made the plants less safe. Employees were understandably hesitant to come forward if they saw or participated in unsafe activities, knowing their report could get themselves, or their coworkers terminated. That led to a situation where injuries and unsafe actions were covered up and underreported. "[The cardinal rule policy] was intended to create an environment that upheld safety, but it had this unintended consequence of undermining safety," Gaddis says. Now employees are given a strike when breaking one of the rules, and instead of being fired they're given the ability to learn from a mistake, even to act as a safety ambassador for other employees. The company also realized that to find unseen, lurking hazards it needed to be less insular, more welcoming of new sets of eyes. The Greeley plant has often been a tour stop for Colorado business groups. In June 2015 it was opened for the first time to a sizeable group of journalists. More eyes, more inspections, more points of view should mean a safer plant, Schult says. "To me that was the biggest learning that came out of this. We're still missing some of these things that we should we be seeing, how can we not be seeing them?" All it took was one unseen trap for Ed Horner to lose his life. One piece of wire mesh over that spinning conveyor belt could've saved his life. The Horners' lives were intimately connected to meatpacking. The couple met in a beef plant back in the early 1980s, both working on the floor of a small plant in Sterling, Colorado. Greta took the job because it paid better than waiting tables or clerking at a gas station. Yes, it had added dangers, but it paid the bills, and gave her a living wage, the same calculation the hundreds of thousands of meatpacking workers make today. After years of working as an electrician outside the beef industry, that's inevitably what took Ed back to the business shortly before he died. "Not that they pay terrific, but they pay a livable salary to the employees. There aren't all that many places like that for blue collar workers to work and get a decent salary and so people go, and work there," Greta says. Ultimately what surprised her the most was just how preventable her husband's death actually was. She hopes leaders at JBS learn a lesson. "They need to realize that everybody that works there is a human being with a life and it's not just a statistic, it's a person. "Their employees aren't cattle that go through the chutes. They're people with families." He had nightmares that the line – what the workers call "the chain" – was moving so fast that instead of gutted hogs flying by, there were people. "You've been working there for three hours, four hours, and you're working so fast and you see the pigs going faster, faster," he says. Meatpacking workers call it "the chain." Sometimes "the line," or "la linea." 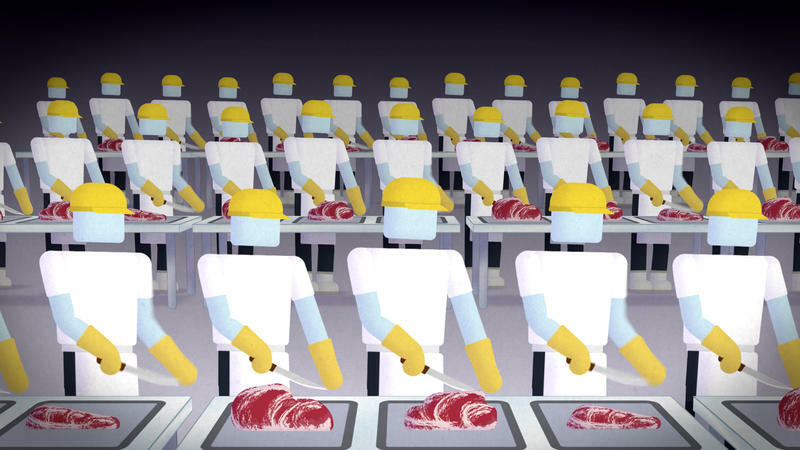 It sets the pace for all work done at meat processing plants, production rates that force workers to make in the tens of thousands of cuts, slices and other movements for hours at a time. Those repetitions affect workers' muscles, tendons, ligaments and nerves, causing what is called musculoskeletal disorders, or MSDs, and resulting in sprains, strains, pains, or inflammation. The rate of meatpacking workers who lose time or change jobs because they're injured is 70 percent higher than the average for manufacturing workers overall, according to the Bureau of Labor Statistics. A slaughterhouse is a safer place to work than it used to be, but data gathered by federal regulators doesn't capture all the risks faced by meat and poultry workers, according to a new government report.